1. Go to the Listing and Checking Toolbar. 2. Select and hold down the Clash Check Icon and select the fourth Icon - Mark Object. 3. On the Command Line you will be asked to choose either Handle / ID - Type H (to select Handle). 5. This marks the object with the problematic feature. 6. 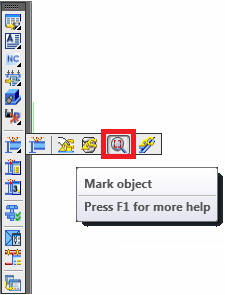 From the Standard Toolbar select "Search for Marked Objects". 7. Using the handle information from the Audit report we will find the object containing the invalid feature, and not the feature itself. After we have identified the object, we will need to manually check the object and search for the actual feature based on the Audit report detail and remove it.